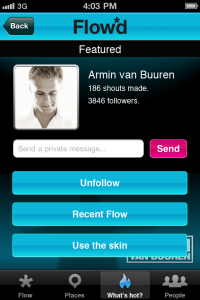 WIN AN ARMIN NYE DOUBLE! As you’re probably aware, Dutch superstar DJ Armin van Buuren is ready to hit Melbourne’s Etihad Stadium this new year’s eve as part of his global ‘Armin Only’ tour. 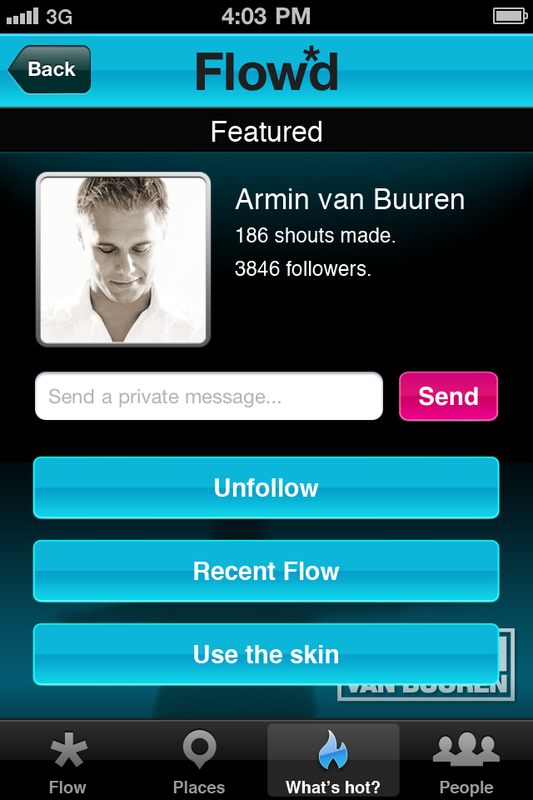 But what you may not be aware is that the world’s #1 DJ has been actively using a new mobile app, Flowd (screenshot left), to talk directly to his fans. Flowd allows fans to follow their favourite artists, receive updates on the latest news and gigs, see exclusive pictures, and even communicate directly with the artists themselves. A brand new feature has just launched that allows users to “check-in” to live shows and events to receive exclusive news, and be rewarded for their attendance. Armin will be performing his ‘Armin Only’ tour this Friday night (new years eve) at Etihad Stadium in Melbourne and would like to invite his top fans to get even closer to him at the show. At the show, Armin will also be running a competition for his Flowd fans, with one lucky fan winning a VIP package to his ‘A State of Trance 500’ show in Sydney in April. So if Santa didn’t spoil you enough yesterday, we’re offering the chance for one lucky reader (18 years old or over) to win two tickets to the Armin Only concert in Melbourne on New Year’s Eve, courtesy of Flowd. What’s the name of Armin van Buuren’s 2010 hit album? Could it be any simpler!? But you’d better be quick to get your entries in, because this one’s live for three and a bit days only! Good luck! Competition closes at 11:59pm AEDST on Wednesday December 29, 2010. One entry per household. Winner drawn at random. Said winner will receive a double pass to Armin van Buuren’s ‘Armin Only’ new years eve event at Melbourne’s Etihad Stadium. Transport costs to/from the venue, parking, refreshments and all other costs are the responsibility of the winner. The prize is a double pass to the event only. Winner notified by email on Thursday December 30, 2010. Winner’s first name, suburb/town and state will be published on the site on Thursday December 30, 2010. Winner will have their tickets emailed to them by the PR company. Winner’s details will be passed on to the publicity company for the sole purpose of prize distribution. By entering this competition, you agree that you are 18 years of age or older. The answer is: Mirage!! My favorite album of the year.